. 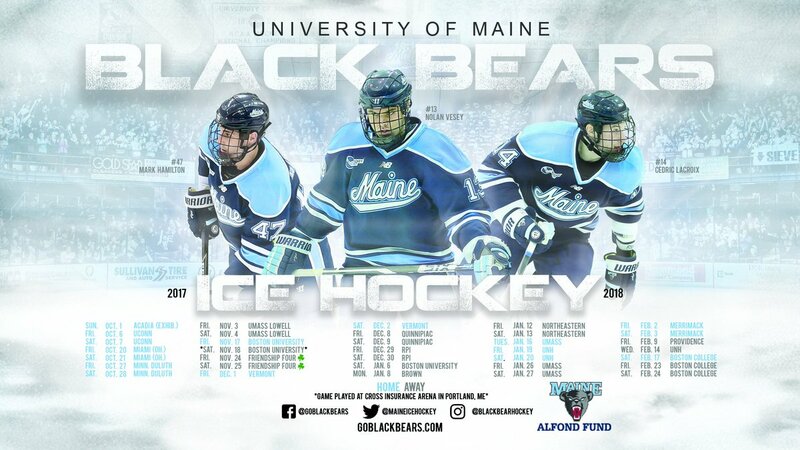 @NolanVesey13 is looking forward to a great senior year with the Black Bears! Here he is at Leafs development camp! #BlackBearNation - our 17-18 schedule is here! See you at the Alfond! ORONO, MAINE (WABI) - It was pretty warm outside but about 50 little hockey players were on the ice today at the Alfond Arena. ...The Bears played three games in Portland last season. “The way the schedule played out it wasn’t feasible to have more than one game down there this year,” Gendron said. After that, UMaine embarks on the longest road trip in program history. The Black Bears fly to Belfast, Northern Ireland, for the Friendship Four tournament over the Thanksgiving holiday, along with Providence College of Hockey East, and ECAC members RPI and Clarkson. Powell River Kings head coach Kent Lewis has been using the word “tenacious” a lot during the BC Hockey League (BCHL) offseason. Lewis said he felt a lack of tenacious play was one of the reasons his team did not go deeper into the playoffs last year, losing the Island Division best-of-seven final series 4-3 to Victoria Grizzlies. Lewis has been on the hunt for tenacity and one of the Kings’ latest signings, 18-year-old Kyle Kawamura, has it. “Tenacious, fast, good shot and he already has a scholarship to Maine,” said Lewis. ...I often associate my love of sports to the 2004 Red Sox. Staying up late to watch the Sox climb back from a 3-0 deficit vs the Yankees will forever be one of the greatest moments of my young life. What got me addicted to sports truly and deeply was not the Red Sox, but another team that made a deep playoff run. 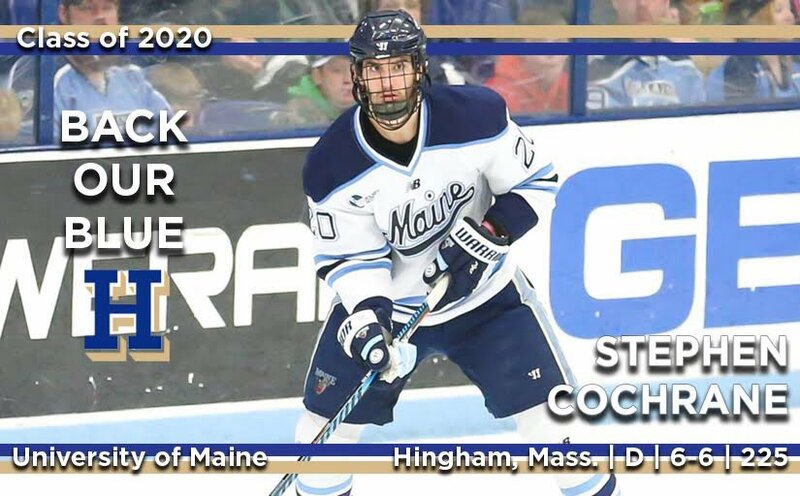 About six months before the Red Sox won their first World Series since the Woodrow Wilson administration, the University of Maine men’s hockey team got me hopelessly hooked on sport. Jimmy Howard, Dustin Penner, Prestin Ryan, Greg Moore, Michel Leveille and company made it all the way to the National Championship game before falling to Denver 1-0. My nine year old self remembers in detail their entire run, because that was the season my dad purchased season tickets at the Alfond. Living an hour and a half away, I spent many long nights (for a nine year old) traveling back and forth to games. Their run started by knocking off UMass in triple OT 2-1 in the Hockey East championship game thanks to Ben Murphy. The number one seeded Black Bears then opened the NCAA tournament against Harvard. RONO - This week, I got the chance to sit down with Jeremy Swayman, a freshman goalie for the University of Maine Black Bears hockey team. In addition, the 18-year-old Alaskan was taken in the fourth round of the 2017 NHL Draft with the 111th pick by the Boston Bruins. Swayman played the 2016-17 hockey season for the Sioux Falls Stampede of the USHL, posting a .914 save percentage and a 2.90 goals against average. He attended Bruins development camp earlier this summer; fellow Black Bear goalie Rob McGovern was there as well. The Maine Edge: How have you adapted to Maine coming all the way from Alaska? Jeremy Swayman: It is definitely a higher level of play, obviously. There are more mature guys. It is the pinnacle for a lot of guys and what they want to achieve at a young age. So, I want to take that route of the college hockey experience. I have come in here with a mind to win games and get better and improve my game and hopefully get to the next level. I see every tool necessary for me to get there [at UMaine].